MAXIM Integrated Products, represented by Arrow Electronics , has introduced the MAX6850 vacuum fluorescent display (VFD) controller with embedded fonts, multiplex timing control, and filament timing for flicker-free displays. The MAX6850 uses a 26MHz 4-wire, SPI/QSPI-compatible bus to interface with a microprocessor. The device controls a starburst numeric or alphanumeric VFD (vacuum fluorescent display) up to 96 characters and supports displays with either 1 or 2 characters per grid. The MAX6850 has 16-step digital brightness control. Suited for displays with predominantly 7-segment, 14-segment, and 16-segment alphanumeric characters, the MAX6850 includes a 104-character font and 24 characters of user-defined fonts on chip. An internal output map works like a crosspoint switch to connect any tube-driver pin to any grid or anode. The driver is therefore compatible with any VFD tube-driver combination, including chip-in-glass (CIG). A cursor segment and up to four annunciators may be assigned per grid, each with independent two-phase blink control. 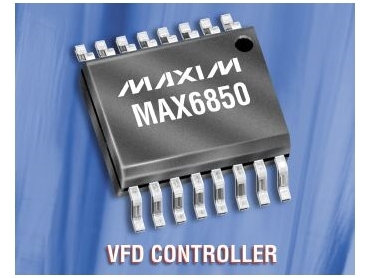 The MAX6850 also provides timing to generate PWM waveforms to bridge-drive the VFD filament easily from a dc supply. The filament drive is synchronised to the display multiplexing to eliminate beat artifacts. Dead-clock protection is built in, protecting the display in the event of a multiplex clock failure. Operating from a 2.7V to 3.6V supply, the MAX6850 features the standard automotive temperature range (-40°C to +125°C) and is available in a 16-pin QSOP (6mm x 9.9mm) package.